Mark Cavendish's Tour de France campaign suffered another setback on Tuesday when the Briton had to settle for third in a sprint after being involved in a crash in a chaotic stage 10 finale won by Marcel Kittel. Omega Pharma-Quick Step rider Cavendish appeared to leave his line and bumped into Dutchman Tom Veelers who lost his balance and hit the ground as he was leading out Kittel for the German's second Tour stage win this year. The race commissaries, however, ruled Veelers was at fault, saying the Dutchman was drifting back and made a small movement towards his right while Cavendish was sprinting. Another German, Andre Greipel of the Lotto Belisol team, took second place while Britain's Chris Froome retained the overall leader's yellow jersey before Wednesday's individual time trial. "When I went out it was too late and there were too strong guys ahead of me, (team mate Gert) Steegmans went early and we ran out of guys (to lead him out)," Cavendish, who angrily grabbed a journalist's dictaphone when asked about the incident, told reporters. "Guys were going fast, we could have done things a little bit different but that's bike racing. My legs are still not great." Kittel, who had won the opening stage in Corsica, was the strongest man at the end of a 197-km ride from St Gildas des Bois, would not be drawn into controversy. 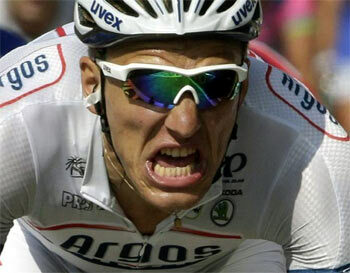 "I saw the crash on video and it was very unlucky that they bumped into each other," Kittel told a news conference. "Tom was going hard from doing the lead-out, Cavendish tried to pass him on the right and the handlebars touched each other and Tom lost control and crashed on the ground. "I cannot imagine that it was on purpose because it was a very hectic situation and it was the last moment of the sprint. Sometimes that is something that just happens." Cavendish later wrote on his Twitter feed: "Just seen the sprint. I believe I didn't move line. I'm actually coming past Veelers & we touch elbows when he moves. Anyway, hope he's ok.
"There's no way I'd move on a rider deliberately, especially one not contesting a sprint." Cavendish, who trails Peter Sagan of Slovakia by a massive 103 points in the green jersey standings, already missed a golden stage win opportunity last Thursday when a crash in the final hour left him too exhausted to put up a decent fight in the final sprint. On Tuesday, five riders, including Tour debutant and local rider Julien Simon, led for 191 of the 197 km before being caught by the peloton as the race entered the Brittany town of Saint Malo after winding along wind-blown coastal roads. It was a relatively quiet day for Froome, who took shelter behind Sky team mate Ian Stannard in the finale. He still leads Spain's Alejandro Valverde by one minute 25 seconds and Dutchman Bauke Mollema by 1:44 with Alberto Contador in sixth place overall, 1:51 off the pace. Froome is expected to dominate his rivals in Wednesday's 33-km flat dash from Avranches to the Mont Saint Michel. "I've done few races with similar kinds of time trials," Froome told a news conference. "You can make small advantages with equipment, we've got a new time trial bike this year, I've spent a bit of time in the wind tunnel, which I had never done before, all these things will add up. "Tomorrow is definitely a day that I want to target and go for it."